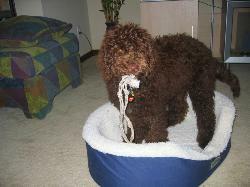 Kendra is a breeder who is devoted to bettering the Australian Labradoodle breed. 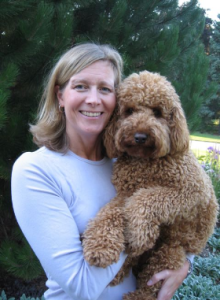 I have had the pleasure of working with Kendra since 2004 and many of her dogs, she provides the best care for her dogs, and is careful to breed only the best with regards to personality, health, and quality. As a mobile veterinarian I get the privilege of seeing my patient’s home environment. Kendra raises her dogs as part of her family in her home, she maintains guardian homes so that she can have a personal relationship with each of her dogs and puppies, resulting in well-adjusted, outgoing puppies. 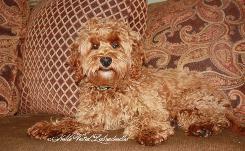 I am proud to recommend a breeder such as Kendra. Thank you for taking the time to research this breed and Kendra Vestal as a potential breeder from whom to purchase a puppy! Our experiences with Kendra have been extremely favorable. She is a conscientious breeder who takes the time to educate the community about this breed and works to produce very high quality puppies. Her adult dogs that I have had the pleasure to work with have been outstanding animals with the best temperaments and outstanding health as well. 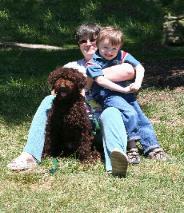 Kendra always works to provide a wonderful experience for her new puppy families. She is available to them for questions, advice and an enormous amount of knowledge that comes from being a part of this breed for many years. 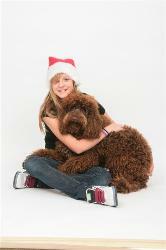 Kendra is definitely the most conscientious and ethical breeder of Labradoodles that I have worked with. I truly feel that you cannot go wrong with adopting one of Kendra’s puppies. She will be with you every step of the way and your family will truly be blessed in making this decision. If you have any further questions, please do not hesitate to call or email us. 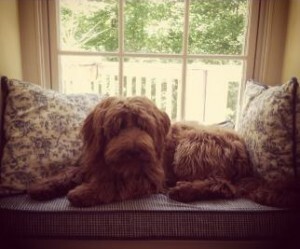 Just a brief note to say thank you for JJ and Olive’s puppy Murphy. She will be one year old on Nov 11. She is the best, smartest, most wonderful puppy. I registered her with AKC as Noble Vestal’s Indiana Murphy. She received her canine good citizen certificate one week ago and also her novice trick dog certificate. I cannot thank you enough, Kendra, for all the thought, care, and work you have put into breeding and raising your puppies. 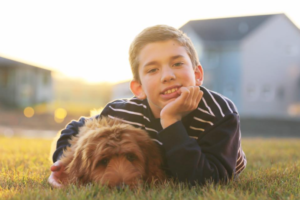 Murphy is amazing – thank you from both of us from our hearts. 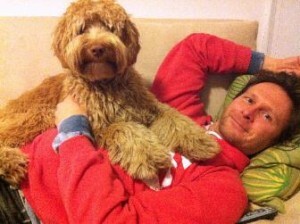 Murphy (and our Tigger) win the longest stay at every doodle romp, beginning when she was six months old. I just want to take a moment and attest to the fantastic temperament of these dogs. Charlie and I were taking a walk, came up to our neighbors and stopped to have a conversation. Their younger children (8yrs and 6yrs were out with them) and after a few minutes, Charlie just lays down. He’s on lead and we are at the end of their driveway still talking. He must know it will be a while.  . Anyway, the neighbors comment on how they love his temperament and how good of a dog he is. They said they usually hate (I know it’s a strong word) the temperament of others doodles they know, even goldendoodles—-and they have a goldren retriever and another large dog, I don’t know the breed. So, yes Charlie is 5 yrs old. Yes. He has obedience training, but I wholeheartedly feel that it all starts with the roots of the pup. Those good genes that get passed on from the parents and those initial weeks while with their mama. Thank you Kendra for matching us with Charlie (or Sir Charles as he is sometimes called)! As one year approaches, I wanted to thank you for giving us Walt. We absolutely adore him. We couldn’t have asked for a better dog for our family. 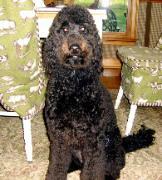 He is loving, loyal, and has the best temperament. We will never use another breeder! If you’d like to see how Walt’s doing, he has his own Instagram account @waltereliasscott. I cannot believe our little girl is a year old today! I wanted to pen this email to you, Kendra, and try to even begin to thank you for the beautiful best friend you brought into our lives. She is the most well-behaved, sweet-hearted, smart, and loving dog I could’ve imagined. She is, without a doubt, our favorite part of every day. the bathroom alone since we got her. Ha! She hangs out in my personal office at my dental clinic many days. She loves walks on the trail, loves showing off her tricks, loves going to Jaryd’s softball games, loves car rides, and loves watching the Cubs and Packers (at least we pretend she does). 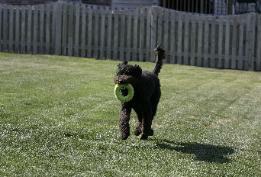 She loves running, playing, and fetching in our new, fenced-in, huge backyard. She loves boating with us, but is NOT a fan of being in the water, even if we put her life jacket on. She loves to visit her cousin Ginger (Pricco… my aunt and uncle’s NVL that started my love for your dogs) and she loves every other dog she can meet. We cannot take her anywhere without being stopped so someone can tell us how beautiful and well-behaved she is. I tell them we spent a lot of time training her in classes and at home, but a HUGE part of that is all thanks to the quality of your breeding program and all the work you do in the eight weeks before she came with us. Especially now that I can compare her to some of my other friends who’ve adopted dogs from breeders who were not of your caliber. Your dogs are on an entirely different level. I didn’t grow up with a dog, but I still thought that eventually when I got a pet that I would be quite attached. That was an understatement. It is so much more than that. I don’t think I could’ve begun to imagine how much she means to me. I don’t know what I would do without her, and I never even want to think about it. I’m sure you’ve heard this all before from all your NVL families, but it needs to be said again. Thank you so much for letting us be her mom and dad, and for bringing such a perfect girl into our lives. We love our Hermione so much. We are SO very grateful for this little ball of love that has completely changed our lives!!! 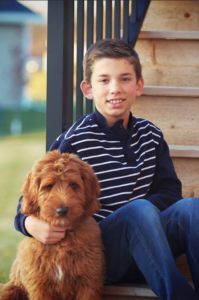 Hank was initially intended to be a therapy dog for our oldest son Jack; however, what we didn’t expect was for him to be a therapy dog to all of us! Kendra, we are so thankful!!! Thankful for an amazing trainer too!! You don’t just breed puppies, you create happy . And believe me my friend you are dam good at it. Hard to believe we picked up Boone exactly 1 year ago. And he’s everything we could have hoped for! We wanted a non-shedding, friendly, sweet, mellow (not yet!) but active dog, and you delivered on that and much more. He is incredibly tolerant and patient with our 7 and 9 year old daughters. They can do almost anything to him and he has never once growled at them or bared his teeth. Even if he’s under our couch in the kitchen (one of his favorite spots) and they climb under with him, even though he’s clearly sleeping or needing some alone time, he welcomes them happily. And he loves them most of all. If they leave the house he pouts and cries. When they come downstairs in the morning he is overjoyed! It’s a special relationship and he’s a special dog. He’s also the friendliest and most famous dog in the neighborhood. Everyone comments about him and his beautiful red, soft coat (my father and I were walking him one day and my father said to me, “you would be rich if you received a dollar for every person who stopped you to pet or ask about Boone!”). And he loves everybody and every dog! We have recommended you to every passerby who asks where we got him. You made our first experience with a puppy so easy and were so helpful, even after we brought him home and were a little intimidated by it all. You were encouraging and always available to answer questions. It’s wonderful that you are so devoted to these dogs that even when they are no longer your responsibility, you want to make sure that the owners are comfortable and doing everything properly. And the pages of notes we left your home with were incredibly helpful, which I referenced for months! We can’t thank you enough for giving us Boone. He’s absolutely perfect. Brett and I are having the time of our lives w/Dugan. He is now 9 mo. old at 52 lbs. and still growing. 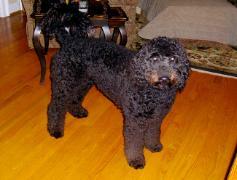 As you know it has been a decision of long considerations since we lost Bruno 4-1/2 years ago. Dugan has such a great personality with people and dogs alike. Since the beginning of becoming parents I wanted Dugan to become very comfortable with all surroundings. Currently I take he to puppy daycare two days a week. He has become one of there favorites and spends his days playing with other pups behind the desk. I enjoy the fact that he is totally exhausted come days end as I know he had a great time. 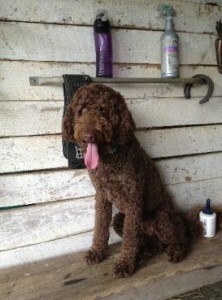 Dugan, also enjoys his quality time with the individuals and store owner alike in our small town. I am currently seeking on Dugan becoming a therapy dog for those of the elder age. I believe non-verbal communication of animals is a benchmark for human happiness. We can not thank you enough for Einstein! We love him so much he is a huge part of our family. Although Jeff was very skeptical about bringing a puppy into our home when our bulldog passed away, Einstein has proved all his concerns wrong and he has won a huge place in his heart. Einstein was very easy to potty train, has never once chewed on anything except his own bones and he is calm and laid back 23.5 hrs out of the day. He is full of love and he gives the best wet doggy kisses. Jeff is truly amazed that E is such a good dog and he was serious when he said that he would take 5 more if you would promise they would all be as perfect as Einstein! Please not all at once! Lol I give you all the credit for matching us with the perfect dog. You are so in tune with your dogs, their puppies and your potential puppy families it is amazing. 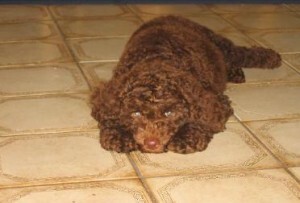 You have that special insite and understanding and ability to place your puppies with the best families. 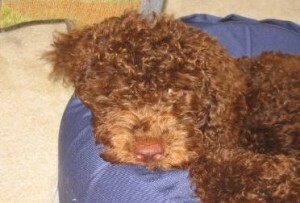 You are not just a breeder, you love and care for you dogs and your doggy families. You are there for them to answer questions, to guide and teach them. You are truly a special person and it shows in all that you do. I was so blessed the day that I found Noble Vestal on the internet and emailed you with questions. The fact that you called me right up and spoke to me for over an hour that first night and educated me and listened to my desires and concerns speaks volumes. 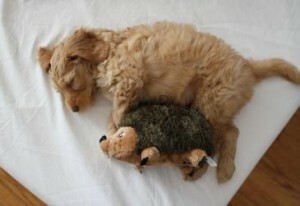 We not only found the perfect dog, we found the perfect breeder and wealso found a perfect friend. I can not say enough about how much we love and respect you and all that you do for your puppies and your puppy families. Thank you Kendra!! Lucky came from Indiana. I have the best breeder ever! 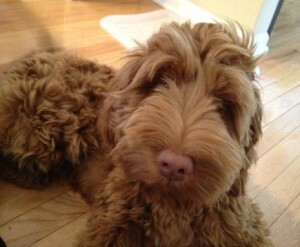 If you are thinking of getting a Labradoodle call her. She is the most amazing, responsible and dedicated breeder. I was skeptical about getting a dog from Indiana especially because I thought I wanted to pick out my own puppy but Kendra convinced me that she makes the decision based on the dogs personality and she could not have done a better job matching Lucky with us! 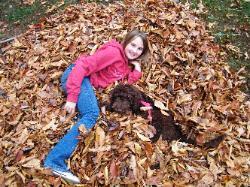 Many years ago I promised my then only child she would have a dog one day. 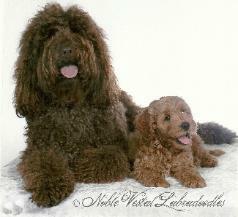 As life unfolded and her younger brother was almost old enough I started researching the Labradoodle breed and the breeders. 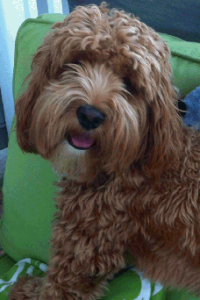 My daughter was extremely involved in the process, often finding available labradoodles on-line and posting contact numbers all over the house. 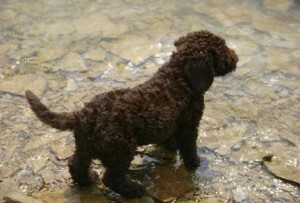 One day as I walked the local pond with my sister”s dog I saw an adorable red labradoodle named Paisley. I asked if she was from a local breeder and was told she came from Indiana. I said I wanted a more local breeder but Paisley stole my heart and before I knew it I was calling I was calling this Kendra in Indiana. Now when I take my Lucky out I see the same thing happen to others. Lucky steals hearts. I can not say enough good things about my experience with Kendra before and after Lucky came home to us. I told her what it was I loved about Paisley and all about our family dynamics and she assured me she would know which puppy to send to us. She certainly did know. Before Lucky came to us Kendra educated us by sending weekly updates and preparatory emails. Each week she posted adorable images of the individual pups in the litter. She let us know around week 6 which puppy was ours. My daughter made a binder and kept every correspondence. We were ready when he arrived at Logan Airport. Once he moved in we did have some questions and I never hesitated to call Kendra for her input. It is hard to believe that Lucky has only been with us for just under a year. I can no longer imagine life without him. He is so smart, calm and adoring. He has had some training and I hope to eventually get him trained as a therapy dog. The Brown family is ridiculously in love with our little Corduroy!! With our oldest child heading off to college, we felt that our household needed something to fill that void, and boy did he ever!!!! We never dreamed We could love an animal more than this little guy!!! 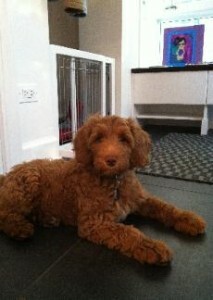 Corduroy is super smart, knows lots of tricks and just learned last week how to get Dad’s paper for him in the morning! He has yet to chew up anything in the house(knock on wood) And waits at the bottom of the stairs for us, while we all get ready in the morning. he knows and respects his boundaries within the house, which never seizes to amaze me! Also, Not a day goes by that we are not amazed by his sweet disposition, but after all, his momma was Sweetie!! 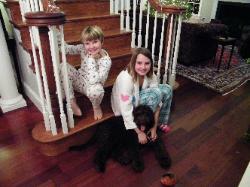 We have attached a few photos for you, Kendra, but also want to thank you for sharing one of hour awesome pups with us!! we love him to pieces!! 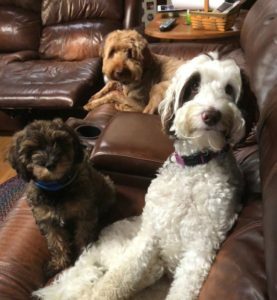 I am not exaggerating when I say there isn’t a day that goes by that we don’t thank our lucky stars that we chose Kendra and Noble Vestal Labradoodles. 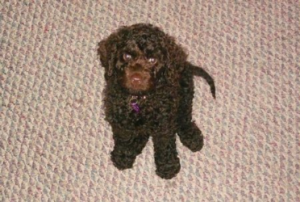 Like a lot of people, when I started looking for a dog I knew what I wanted the dog to ‘look like’. Kendra was very understanding and accommodating in terms of this; ultimately, she delivered us the most beautiful dog (the pictures don’t do him justice. We can’t go for a walk without people stopping us to ask us about him.) However, we soon realized that the biggest asset a dog can have is a great personality and Kendra is clearly an expert in this area. Through a series of questions and conversations she matched us with the right dog for us, and what a dog! I’ve owned other dogs before but none of them had a personality like our Noble Vestal pup. Arty is so smart and therefore easy to train, he loves life, he’s extremely cuddly without being needly, he gets along well with other dogs, he even seems to have a sense of humor. He just makes us very happy! Kendra was always available to answer my questions and you can tell she truly loves all her dogs! Our Harry is simply a delight: sweet, smart, friendly, kind, curious, lively, a bit rambunctious but eminently trainable, the perfect pet and friend. He is now a bit over two years old, and has become a bit of local celebrity, my neighbors like him and so do our friends. It is no secret that I’ve always claimed to not be a “dog person.” Quite frankly, I was ridiculously scared of them. I’d been bitten a few times when I was a kid…. and the dogs sensed my fear which just made things worse. When I became a photographer and people were wanting photos with their dogs, I’d comply but reluctantly. People would always say, “but you won’t be scared of my dog… s/he’s better than the others!” Well, they were wrong… I was always frightened. …and then the strangest thing happened. I, in an instant, wanted Bauer to be our dog (that wasn’t his real name, but that’s what we called him for the day he was ours). As cheesy as it sounds, seeing him follow Mike around in our home just felt right. That evening we posted signs around the neighborhood and within an hour, Bauer’s real family called us… “OH! You found Buddy! What a relief!” How bittersweet that was. It was in that moment that I knew we needed a dog in our lives. 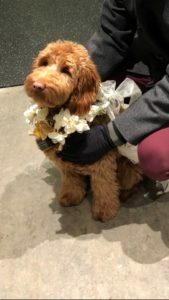 There was only one requirement… our dog needed be a hypoallergenic breed because with our workshops, we have a lot of people in and out of our home, so that was very important to us. 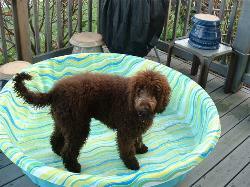 We had it narrowed down to a Portuguese Water Dog and a Labradoodle. 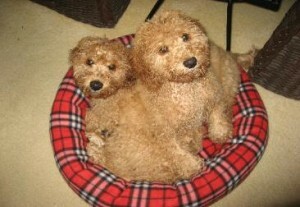 I found two dogs that were available in the Midwest (one of them even in Indiana) on a “Doodle Rescue” site. We filled out the verrrry long application and waited to hear back… and waited… and waited. Then I emailed and waited… and waited…. and waited. A month later I re-checked the site and found another doodle available for rescue. We re-submitted our application. We didn’t hear one word from them! I became very frustrated with that whole process so I started researching local breeders. 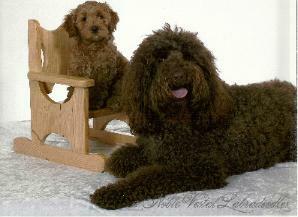 After a big of Googling / forum reading I soon found Noble Vestal Labradoodles, located 30 minutes north of us in Noblesville, Ind. I called and spoke with the owner Kendra and started following their biz page on Facebook. A few months later I saw that she had a three year old stud dog from Colorado named Murphy who needed what they call a “guardian home.” Mike and I talked it over and off to Noblesville we went to meet him. I was immediately smitten! NEVER (really, NEVER!) have I pet, let alone cuddled with a dog. Murphy, however doesn’t take no for an answer. He craaaaaves the attention… I gave it and he took it…;)There, she also had a very pregnant dog who climbed into my lap, looked up at me and said “pet me now, I’m irresistible and pregnant.” So I did… I rubbed on that very full belly of puppies. I just knew I’d found the place to find our perfect companion. 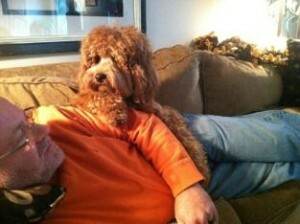 I asked lots of questions… “I know we’re his ‘guardian parents,’ but is he really our dog?” Absolutely! she answered. “Does that mean that when you’re done with him you’ll take him back and sell him to someone else?” Nope. He’ll be 100% yours. 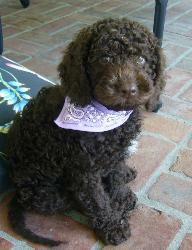 (Sidenote… Murphy does on occasion have puppies available so be sure to check out Noble Vestal’s website for more info). Now, looking back I can’t believe I haven’t had a dog my entire life. It’s so hard for me to put into words. The amount of joy, contentment and just plain fun that he’s brought into our world is unbelievable. For the first time in my life I get it. I get why people are obsessed their dogs. When we come home after a few hours away and he’s about to go crazy with excitement… there’s no better feeling. Oh how we love this dog! Last week, for the first time… I busted out the big camera on his cuteness. Three things. 1) I have a whole new respect for dog photographers; they’re hard to photograph! I’d get close to him to snap a photo and he’d want to do is snuggle. 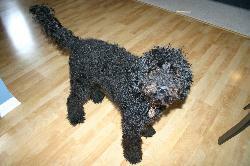 2) Black dogs are especially hard to photograph (especially if you prefer naturally lit photos like we do). Here’s what I learned… Creating a ratio is the best way to get around it (light coming in from one side). 3) I’m about to be crazy dog person and frame these all over my house. Judge me, I dare you! Murphy has the most beautiful brown eyes! 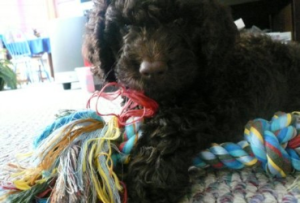 As recent customers of your breeding services we are more than happy to extend our personal feelings of support and appreciation for the process you have established for breeding, raising and readying your Australian Labradoodle. Sydney is a precious addition to our family and arrived ready for our home environment and almost completely potty trained. With all shots and medical records ready and ID tag intact, our local vet’s office found her quite the envy of all. The attendants and doctors who see dogs regularly all came out to see our beautiful and well mannered Sydney. At six months she is quickly learning all commands and behaviors necessary – your comment sheets and materials available to us have been well used as well. 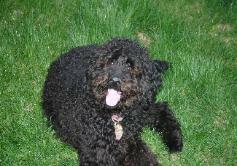 Sydney is adept at sitting, whoa, shake with either paw, laying down, fetching and coming. I walk her at six months without a leash and she never ventures over 20 yards away. I am currently able to whoa her on one side of the street and cross to the over while she waits to be called. She is eating well, using her dog door to the outside easily for outside pottying, and loves to romp and play either with other dogs or our very young grandchildren. Your home was open to us from the beginning and your constant emails and web site pictures kept us informed of all information plus wonderful pictures. Please let us know if someone would like to talk to us personally. 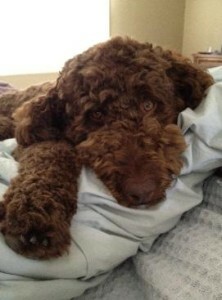 My wife Bonnie and I decided that we wanted a labradoodle some years ago after research on service dogs… Bonnie is a juvenile diabetic and we were hoping to train the dog to help her anticipate insulin reactions. In addition, we were (and are) hopeful that our dog could be a therapy dog. After research, we concluded that Noble Vestal Doodles (and Kendra Vestal) was the breeder with whom we wished to do business, despite the fact that it is located about 200 miles from where we live. Kendra listened closely to what we wanted to achieve and chose a puppy for us, which puppy we named “Lehigh” and picked up, at the age of 9 weeks, about 3 1/2 years ago. Lehigh is exactly the dog we wanted. Excellent with persons of all ages (including our grandchildren). 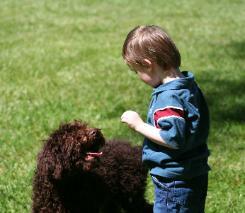 His socialization was already well started and we paid close attention to that as he grew up. Kendra remained interested… our contract with her required that we let her know about training and his progress. 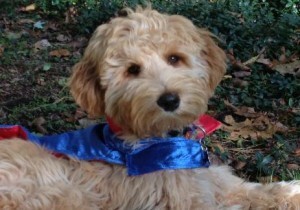 Lehigh received his CGC and is an official Therapy Dog now. 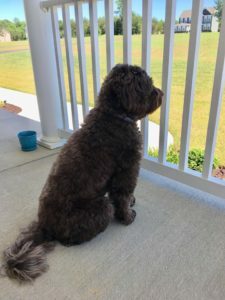 We couldn’t be more pleased with the experience with Noble Vestal Doodles… we’ve talked about a 2nd dog… when we get serious, we’ll trust Kendra to help us to the right 2nd dog. Buddy is doing very well. He is a great dog! Smart, mellow, patient, curious and loves all dogs and people. He gets to run in the regional parks in the hills with a group of other dogs every day. He also gets to walk about every other morning and a couple of times on the weekend. He really likes riding in the car (in his crate) and sailing on the San Francisco Bay. Here are some pictures of the first time Buddy met Alex. It was truly magic from square one because he promptly let go of g-ma’s hand and went to pet him. Alex NEVER goes anywhere at this point without a hand to hold. I will look up the ones from the actual placement and send some of the better ones of them too. Alex has benefited from this placement tremendously. 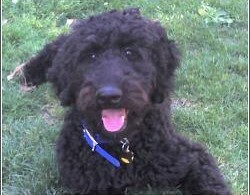 If you ever breed his parents again please let me know, we are interested in getting several more Noble Doodles to train. They are the easies by far to train, it is almost if it comes naturally to them. I just wanted to tell you how great Coco and Cody are doing. They are inseparable! 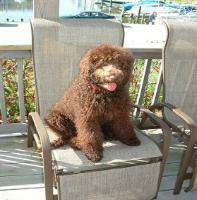 Coco is getting ready to start her first year at a local elementary school as a therapy reading dog. 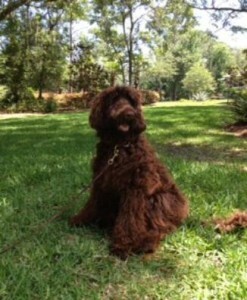 Coco has done great with her training and is certified through the Delta Society as a therapy dog. She absolutely loves kids! Then there is my new sweet puppy Cody! He has brought so much joy to our family. He is getting ready to start his therapy training. My vet and trainer are amazed at his outgoing personality and have told me how great he is going to be as a therapy dog. He has never met a stranger and has never once had an accident in his cage! He has been such a great puppy to train with my busy lifestyle. On the weekends we are always going somewhere! 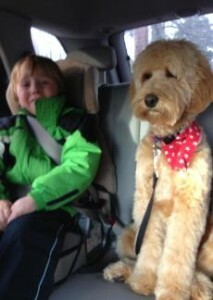 He loves to go “bye-bye.” Coco and Cody sit in the front seat together and off we go. This summer we have spent every weekend at the lake and they love to chase after the ducks! 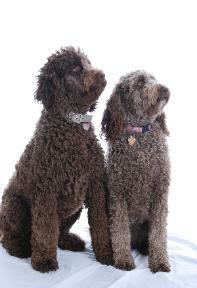 Just wanted to let you know how special my dogs are and how much I appreciate you being such a good breeder! 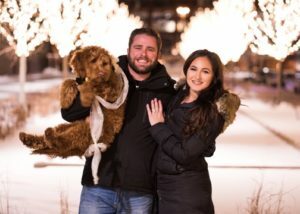 Just wanted to take a minute to tell you how happy we are to have Tilley as part of our family. She has a lovely temperament. When the children are around she is playful and makes them laugh. When we are alone, she is quiet and peaceful. She is truly delightful. She has a host family for sleepovers when Don and I are out of town. And she is the star of doggie daycare on the two days a week that I work. Someone always wants to “take her home”. She has been very easy to train. Puppy kindergarten was an experience! But she has now learned to sit, stay, shake, heel and most importantly to come when called. We are working on off lease obedience (in public places) and she is doing very well. Hi Kendra – just wanted to say thank you again for Reese. She has adjusted so nicely to our family life. Both boys just adore her. She is such a sweet girl. I hope all is well. Attached is a picture of Wally and Darwin in September. They were together again this past weekend and will be romping non-stop again this coming weekend. They just love each other! I can’t tell you how happy we are with Wally. He is just such a good little puppy. He is so smart and loving. He is such a joy in our lives. We are contemplating adopting a brother for him. We just wanted to share some of Kona’s 2 year birthday pictures. She is doing very well and still loves playing and socializing. She had her yearly checkup yesterday (Saturday) and was given a clean bill of health! We have also included a link to some pictures. Let us know if you have another family reunion next summer, we were out of town this year, but think it would be really fun! How’s Hussy doing? Here’s a happy customer – my son Andre with his new friend, Reese! We are enjoying her – she’s so easy, gentle, and affectionate! I just realized that I didn’t send you our holiday card. I’ve attached a few photos of Baby Ruth. I hope that all is well with you. Hopefully business is good with the new president wanting a doodle! I give your name and number out often. She is such a great dog. She looks just like Atta Girl. Matilda (affectionately known as Matty) is loving New York City! She’s a regular at the dog parks and gets called a “muppet” or “sesame street” character at least once a day. 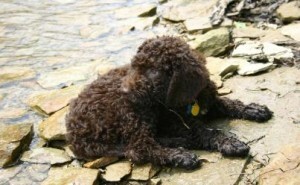 Brown Grover or Cookie Monster are the most popular names. She’s a gorgeous fur ball! Her coat is so perfect. She’s got gorgeous curls and beautifully furry legs and I cannot believe I’ve never seen her shed one hair in 4 months. 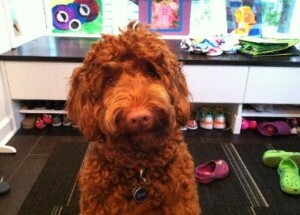 You’re famous in the NY dog scene as everyone asks where we got such a perfect Labradoodle. She’s an absolute treasure, with a sweet yet strong personality, well behaved yet always doing something entertaining. She’s so smart and so good with kids from the first day we got her. She was house trained within 10 days! The list goes on and on…Bottom line is we love her and you’re the best! Thank you so much for your help in choosing our first puppy and for your support in training her and in training us every step of the way. We look forward to many special years with Matty. All the best for 2009. Here are some photos of our girl. She is a dream and we LOVE her. *That IS our girl. It was probably at one of Mac’s football games – she has been stealing the show on a regular basis. Everyone loves her – what’s not to love. She is a dream and is house training well. She is growing so fast! *I got an email from a stranger who took a picture of a random dog, after seeing our site she sent it to me because she knew it was one of ours! And of course it was Aussie!!! 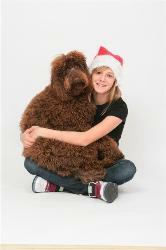 A LABRADOODLE BREEDER TRULY THE TOP OF HER CLASS! It is so often we hear all of the negatives and the positives are never heard. 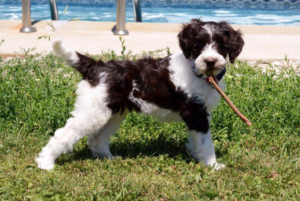 I would like anyone who is considering buying an “Australian Labradoodle” to hear about my wonderful experience in dealing with… KENDRA VESTAL. 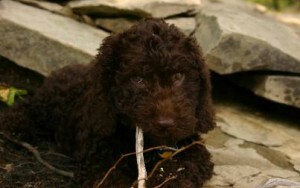 On October 4th 2008 my husband and I picked up our gorgeous chocolate labradoodle boy at the airport in Ct. He (Tucker) was absolutely perfect! Just as Kendra indicated and assured me time and time again that he would be. “Just what we were looking for”. Because we are already the owner of a precious apricot doodle and would not trade him for the world, our request for what we wanted was not exactly what we received. Our first doodle (not from Kendra) although sweet as could be and we love like no other, has a very interesting coat to say the least. The loose soft curls we requested turned out to be well… I just don’t know what you would call it, Soft loose fleece coat Definitely Not! That being said. Even through these difficult economic and trying times it is so easy for us to be grumpy and irritable at times. As you could imagine, I had placed numerous phone calls to Kendra Re: the puppy. Time and time again… the other end of the phone was always Cheery, Knowledgeable, Kind, Patient, and Extremely Attentive to my concerns and needs. Even after the delivery of Tucker Kendra continued to call on a daily basis to be sure Tucker and his new family were adapting well. 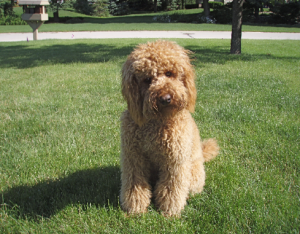 Kendra’s Knowledge and Love for this breed is passionate and I recommend her to anyone looking for a loving Quality Australian Labradoodle. Thank you again for a wonderful family member. We are always saying to each other, “she’s such a good girl” or “what a good girl” She makes us laugh so much! Edmond is doing GREAT!!!!!! He is the best dog ever. The attached PICs were taken today. He needs no encouragement to get in the lake. Will keep you posted. 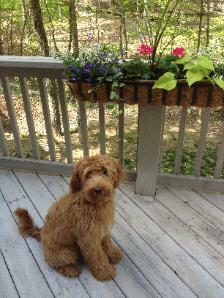 He got his summer cut yesterday and I think the groomer did a fantastic job. He’s a sweet, sweet boy and I’m so thrilled to have him. OB1 has such an incredible personality–what a charmer! He is everybody’s favorite at the Dog Park! OB1 has a brother Snickers that joined him and a sister who joined him in 2013! Flash is amazing. She is extremely intelligent, loves to learn, loves to play. She knows when bedtime is and often goes to her kennel before I get up to brush my teeth. 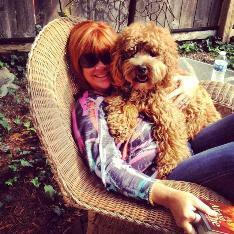 We love her dearly and are so grateful to you for breeding such wonderful dogs!!! I just wanted to let you know that Kona is doing wonderfully, she has gotten big 45lbs last we checked. Her face, paws and tummy have started to go red; there is a gray streak beginning down her back. She is extremely social, loves all the kids in the neighborhood and plays very well. She still thinks she is a lap dog, and loves to cuddle. We just wanted to let you know that Kona is adjusting well to her new home. She loves to run in her new backyard and play catch with Eric, or chase me around the house and fall asleep in my lap. She has a new friend blue; she takes most of her naps on top of him or on my shoes, I think she is really becoming more comfortable in her new home. She really liked the stick you bought her; she has come close to wearing out the squeaker. She is eating well and we are working on the potty training, there have been a few accidents but a lot less than we predicted so far. I think the hardest thing is putting her to bed at night, she cries and barks until she wears herself out sleeps for a few hours then cries a bit more, we have been able to calm her down most of the time and get her back to sleep. Hopefully she will get adjusted to her crate soon and start sleeping a bit better at night. She reminds us a lot of Hussy, she sits pretty like her mom and runs like her too. We are attaching few pictures one that very closely resembles one of hussy on your website. She is a wonderful addition to our family. Here we are after a fun time at the beach. Willy wasn’t too sure about the water. I like to showoff so pretended to like it at first and then even practiced some puppy paddling. The tidal pools were our favorite because they didn’t have waves. I think I like the water more than Willy. He doesn’t even like a bath but I do. 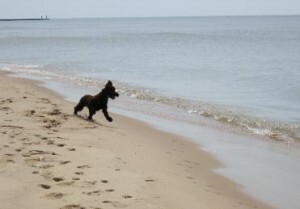 When Willy’s Mommy and Daddy came home, he was better about trying out the water but the waves were still a little scary. They all like to sleep on the beach. Everybody loves us and can’t believe we are brothers. Willy is heavier than me but I looks bigger. Willy looks like Grams and Pops’ Hayden Bear. We loved meeting all the people who were in Kiawah for Teresa and Kent’s wedding. Wow! Sometimes it was too much for us so we were glad that we had our puppy playroom where we could chill out and take a break. We are both glad to be back in Kentucky. I went over to visit Willy last week. Sometimes I really miss my brother. I am glad he lives in Louisville. We had so much fun playing with all the kids and even the grown ups. We had to stay home for the wedding, but that was okay because we were always ready to go to bed early. There was so much to do. We had to practice our good manners all the time. We are getting pretty good. Everyone said that I was the best listener. Grams calls me the perfect senior citizen dog. Pops and Grams really like me so I try to be very good. Pops is a pushover but Grams says I have to practice my manners with him too so I do. Grams has a few questions to ask you, but she said toI will send you another picture when I get to be a little bit bigger. I hope you are feeling better now. I am so happy to tell you that Yoshi and I passed the Delta Evaluation tonight… and passed with flying colors! He did such a great job. We worked really well together. I just can’t tell you how happy and excited I am. I will keep you posted as to where we will be volunteering. Renee and I had a birthday party for the Yoshi and Sake yesterday….. it was pretty cute. 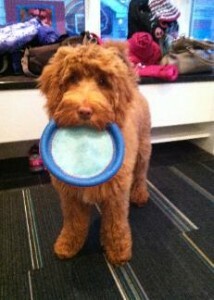 Yoshi is a Tegan Park Vivaldi & Sweetie Puppy! Just wanted to send you some pictures and let you know that Roxie is doing great at her new home! She loves to roam around the yards and even though our feet are her favorite chew toy, she’s learning the obedience commands: sit, down, stand, etc. very well! The obedience school instructers are very impressed with her quick learning and cleverness! She loves to cuddle up in our arms and take naps like a baby throughout the day, she’s just so darn lovable! Also, anyone who sets eyes on her rambles on about how darling and adorable she is! We recently had a baby shower at our house and everyone simply adored her all night! She loves every new person that comes to our house, she greets them with kisses galore! Anyway, here are some cute pictures of her here at our house! Considering these are our “girls” we have lots of photos. Attached are a couple recent ones. Kami set up her photography equipment for some family photos. Family debate as to who they are more loyal to. Opinion of my better half is that I give more treats, thus they hang around me. Koko is your typical dog. 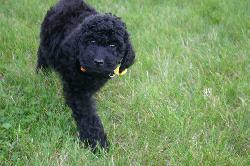 Loves to run, play and chase Kola. Koko will sit next to you and lean her head way back when she wants her ears rubbed. Pretty much barks at whatever Kola is barking at and then attacks Kola. Very cute. Both dogs are fantastic with kids. We have nieces and nephews ranging in age from several months to 9 years. Kids love the dogs and dogs just lay there and take it from the little ones. However, we have had to replace about 8 remote controls. Dogs don’t touch anything they are not supposed to when we are home, but if we leave something new out. It is pretty much a given it will be chewed up. Pretty sure its Koko, but I wouldn’t put it past Kola to talk Koko into getting something she wants off the table. Kola is definitely a smart thinker. She is very shy with new people and when family comes over she hangs outside or in her kennel. I think she has some “cat” in her because she tends to do things on her own schedule. However, she loves to chase squirrels and birds. Treats: Koko gobbles it right up…Kola takes it away and eats at her leisure. Koko will run through the doggie door at full speed. Kola will walk up and test it with her paw before entering or exiting. Goofus and Gallant would best sum up these two dogs. I will say ours were the two best at puppy training and when we go to the dog park the will stick with us as we walk around the track. 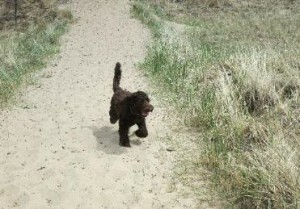 Kola out front with her tail up strutting her stuff while Koko is trying to find someone to play with. 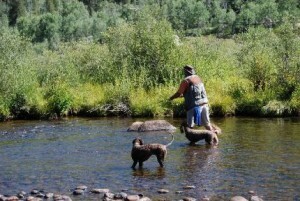 Great dogs… I would consider getting a few more just for the pure pleasure of their companionship. They are great to travel with and have been over most of the surrounding states to Utah. I hope all is well with you and your family. I watched your appearance on the pet segment of your local news – it was awesome! Muddy is still doing great, I have found a great trainer who we are working one on one with for some fine tuning and advanced obedience stuff (not the show obedience, the practical kind!). I promised a very long time ago to write a reference for your training program, and I am finally going to do just that! 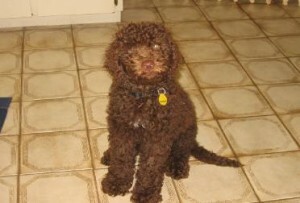 For us, we spent a lot of time researching breeders when we had decided that we wanted to add a labradoodle to our family. When we found Kendra, we had found the perfect match. We were looking for someone who truly cared about the well-being of her dogs, as well as the homes in which her puppies would be placed. Anyone who has had the pleasure of bringing a new puppy home has learned quickly that while they are adorable, they also are a lot of work. Getting it right from the start requires time and persistence that many people just don’t have, and when you try to rush or take short cuts on training, the results are typically bathroom accidents and a less than obedient dog. 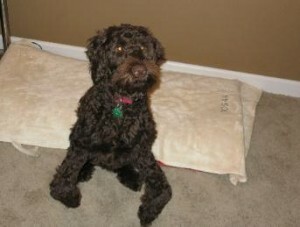 We knew we wanted help to get the foundations right for our new puppy and chose to invest in Kendra’s training option. It was hard to convince my husband that the investment in the training would be worth it, however he now tells everyone that this was the best decision we could have possibly made. We cannot say enough how valuable this was for our family. Not only did we get a well-bred and amazing puppy, but when he came to us he had all of the basics down pat and all that was left for us to do was to reinforce the training. 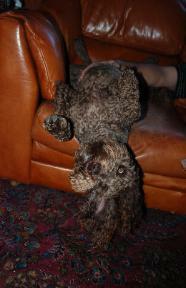 We can say that our dog, now over 1 ½ years old, has never had an accident in the house. All the training promised was delivered. You could tell instantly that the training was done with positive reinforcement, as everything he did was with a “smile”. Kendra was great about giving us advice on how to continue the training, and we followed it strictly and have an amazing dog as a result. Every day I am thankful to have such a wonderful dog as part of our family. I am definitely going to be watching out for when you get back to breeding the bigger ones! We just wanted to write you a short email thanking you for doing an excellent job breeding and training our dog Sedgwick, who is now just over two years old. 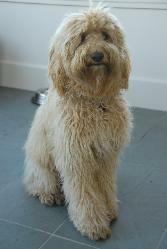 Sedgwick is smart, loyal, sweet, and fun-loving and has proven to be an excellent addition to our family. He is also an outstanding watch guard. Sedgwick loves other dogs and people, but doesn’t care much for squirrels and birds! Sedgwick is a “rock star” and it is impossible to get very far on a walk without someone stopping us to admire him, and ask us numerous questions about him. We love Sedgwick very much and want to commend you for a job well done! Please keep it up! I have been meaning to send you a note about Berkeley to let you know how he is doing – he is just fantastic. He has grown into a such a handsome, loving boy. He had a semi-annual check up in July during which he was pronounced “beautiful and healthy,” and he is a true joy to have in our lives. He stands about 19 inches tall at the withers and is 33.6 lbs – the vet said he will probably fill out a little more over the next year but probably won’t get much bigger. We have had the good fortune to be visited by family many weekends this summer, and Berkeley has proven himself to be a gentleman of a host – he greets all guests with enthusiasm, and tries to squeeze himself into their laps if they invite him to hop up onto the sofa with him. He loves to play with his toys (and his mom is a total sucker for Moochie and Co. so he has quite the collection), loves to go on walks, loves to play with the neighbor kids, and LOVES car rides. He recently learned about the wonders of Dairy Queen’s “doggy dish” and gets one once a month or so, and can barely contain his excitement in the drive through line because he knows what’s coming. He also loves “pup cups” from Starbucks when he’s running errands with me. We can’t take him to the vet’s office or Petsmart without people stopping us to ask what kind of breed he is – everyone tells us how cute and friendly he is. 🙂 I have given your name to multiple people, and my aunt is currently trying to talk her husband into adding a Doodle to their family. I’ve attached a few recent pictures of him so you can see how he looks these days – one of them is my very favorite because it’s the first thing I saw a few weeks ago when I woke up and found that Berk had hopped into bed with me and was laying with his head on the pillow. Good luck with the upcoming litters and have a great rest of the summer! I just wanted to check in and let you know how much we love Cooper! He is such a great dog! He is sweet, playful, very smart and very affectionate. He has such a fantastic temperament for a puppy. His “fleece” hair is gorgeous and the amazing thing is it doesn’t matt! That is amazing for how long his hair is! The other great thing about him is he is everyone’s friend. He loves to meet new people and new dog friends. I can not tell you how many times we have been stopped while walking him or at the dog park because people want to know all about him. 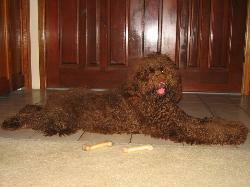 The most common remark is that they have never seen a Labradoodle with such fantastic hair and such a rich chocolate color. 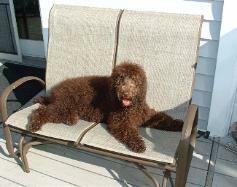 Our vet has remarked several times about his great bone structure and that she can tell he has been well breed. She said he had many characteristics of a show dog. But most of all what we love about him is how quickly he has become such a beloved part of our family. He is so sweet, loyal, smart, affectionate and very much interacts with everyone in our family. Thank you for always being available to answer any questions and thank you for giving us Cooper! We just love him! !